Across Kansas, it was swearing-in day for state and county officials elected in the 2018 general election. 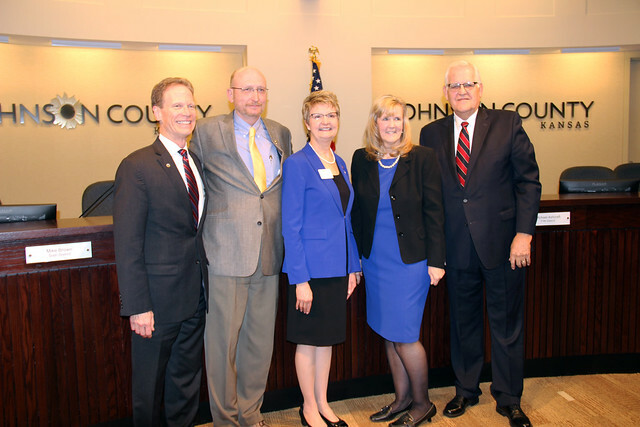 In Johnson County, the Board of County Commissioners (BOCC) hearing room was standing room only with an overflow crowd as four commissioners, two newly elected and two re-elected, took the oath of office from the Hon. Thomas Kelly Ryan. Freshmen commissioners, Becky Fast and Janeé Hanzlick represent the 1st and 4th Districts, respectively. Commissioner Fast has a long history of public service and commitment to the county, including serving two terms on the Roeland Park City Council where she was elected unanimously to serve as council president. Hanzlick is the former CEO of SAFEHOME, Johnson County’s domestic violence agency, where she spent 20 years working for a safer, stronger community. She was a leader in implementing the Johnson County Lethality Assessment Program (LAP), a collaboration between the District Attorney’s Office, law enforcement and SAFEHOME, that significantly reduced domestic homicides in our county. Voters re-elected Chairman Ed Eilert and 5th District Commissioner Michael Ashcraft in November 2018. Eilert was re-elected to a third term in November 2018. Prior to serving as Chairman, he served as the 4th District BOCC representative for four years. Chairman Eilert’s career in public service also includes 24 years as the mayor of Overland Park and four years as an Overland Park City Councilman. Commissioner Ashcraft was sworn in for a third term. His Board and Committee assignments include the Library Board, Investment Review Group, Stormwater Management Advisory Council, Audit Committee, MARC – 911 Committee and the Metropolitan Culture Commission.